Since 2008, or so, some conventional approaches to design-led urban regeneration have begun to unravel. The global financial crisis has produced pressures on municipal budgeting and undermined a property-led financial model of urban development. This has been met by important developments in the status and application of design. There has been a growth in the importance of discourses of participation and co-creation in design and design as a tool for policy and strategic thinking on several scales. This has opened up a space in urban policy where design’s role is more to process thinking and action within networks of material resources and human assets, than to solve problems. Kolding is a small city with 57,600 inhabitants located on the southeast coast of the Danish peninsula of Jutland. 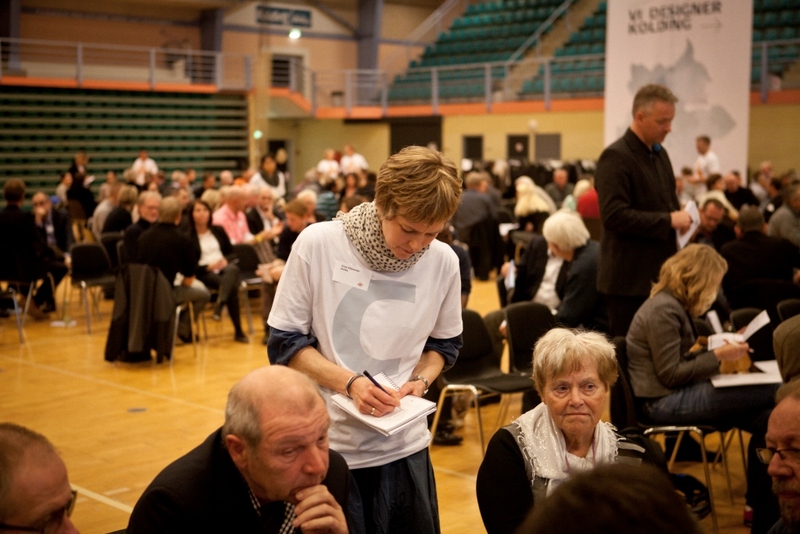 On 10 December 2012 the Kolding Municipal Council unanimously adopted a new vision for the city and municipality: ‘Together, we design a better life through entrepreneurship, social innovation and education’. Later this became ‘Kolding – We Design For Life’. Design was to be at the centre of all city development activities within a 10-year programme. As such, the Kolding case provides a ‘living test lab’ for the experimentation of new forms of social welfare, cultural, educational and commercial practices. In a broader context, it opens design-led regeneration onto more open-ended, processual conceptions that provide a departure from more orthodox approaches both in policy and design terms. This article begins with a critical review of those ‘traditional’ approaches to design-led urban regeneration, revealing something of a policy vacuum, created not least by the global economic slowdown. It then reviews broad shifts in design practice over the past 10 years that signal possible future directions. The envisioning of Kolding’s new regeneration programme is then recounted to establish its place against these wider directions and demonstrate the emergence of a new form of design culture. This is then contextualised in Danish questions of governance, political economy and regeneration. The concept of design-led urban regeneration places the fashioning of aesthetic resources and markers at the centre of attempts to revive post-industrial towns and cities, both in their productive capabilities and their social milieux (Bell and Jayne 2003). This contrasts with, for instance, strategies such as the provision of direct subsidies to industry through tax-relief or indirectly through infrastructure investments. From the late 1990s the strategic use of design in urban regeneration was marked by the four well-known tactics of urban design, creative industries development, cultural planning and place-branding. Since the strident use of urban design in regeneration processes in Barcelona from the 1980s, the provision of new pedestrianized areas, plazas and squares has grown afoot elsewhere too. This has been criticised for its application of codified design systems without enough attention being paid to local needs, sometimes even combined with low building quality (Urban Task Force 2005; Julier 2009). This broad-brush approach has been seen as working hand-in-hand with gentrification processes to privilege the ambitions of property developers (Boddy and Parkinson 2004; McCarthy 2007; Syrett and North 2008; Kauko 2010). The use of creative industries as a mechanism for the economic, social and cultural revival of urban agglomerations has been most vigorously championed by Richard Florida (2002). Many of his assertions have since been challenged, not least because of their circular logic (Peck 2005) in that the assumption is that attracting the ‘creative class’ involves attracting the creative class who, somehow magically cluster together. In terms of design, this idea of ‘clustering’ is challenged by Reimer et al. (2008), who demonstrate that designers are more concerned to locate close to clients rather than to each other. In other words, a ‘creative city’ requires infrastructure, pre-existing demand and resources. Creativity can’t just be parachuted in. Cultural planning, the creation of locations or events to draw inward investment and boost tourism is also a much discussed regeneration tactic (e.g. Vahlo, this volume). In broad terms, this leads to a ‘cultural arms race’ (Hassan et al. 2007), wherein places are constantly having to deliver new projects for the attention economy. For design this has led, for example, to the exponential rise of design festivals, biennales or weeks. Not only does this become a homogenizing force where similar formats are reproduced globally (Gonzaga 2012), it also contributes to a view of design as ephemeral and short-term in its impact, as initiatives come and go in accordance with the annual cycle of the cultural calendar (Berglund 2013). Finally, place-branding may be viewed as equally brittle. Drawing from the notion that a location can be dressed as a product (Anholt 2002; Papadopoulos and Heslop 2002; Bennett and Savani 2003) it takes a ‘fast’ approach to establishing and communicating identity as slogans, logos and other forms are mobilized to tell a story of a place (Evans 2003). One criticism of this tactic is that it sometimes provides a layering over it that can ignore cultural difference within it while pandering to neoliberal notions of cosmopolitanism and enterprise (e.g. Ameel, this volume). It can therefore lead to a decoupling of promise and reality in its enthusiasm to sell (Turok 2009). Design is embedded into all these four well-known formats. However, while these are often deployed in relation to each other by town, city or regional authorities under various forms of ‘strategic vision’, they are usually developed and implemented under the auspices of separate departments: for example urban design managed by planning and architecture departments, creative industries by economy or enterprise sections, cultural planning within leisure services and place-branding usually by marketing departments. As such, their work is normally focused on specific material outcomes, like for example, a paving scheme, a media and design hub, a theatre or concert hall or a branding scheme respectively. Here a vision is turned into a strategy, which is then moved through plans that are undertaken by departments, culminating in their materialization. As such it is difficult to conceive this approach as being truly design-led. Rather, design appears more as an output that may or may not lead on to other things, like inward investment, attracting skilled knowledge-economy workers, more entrepreneurship, etc. Notwithstanding the problems encountered in each of the above four approaches to design-led regeneration, the global economic recession has sent these into further disarray. All four are capital intensive: they require high investment in urban schemes, buildings and/or visual communications, plus consultants’ fees in fashioning these. Against this, we have seen dramaticreduction in public sector budgets across Europe (BBC 2012). This has undermined notions of the ‘entrepreneurial city’ where municipal councils play a leading role in stimulating business and property investment through design-intensive capital projects. Furthermore, while facing budgetary constraint, in many quarters there has been increased demand placed on frontline services that are delivered by municipalities such as education, health and social services. This is due, mostly, to demographic changes such as the ageing population, rises in unemployment and migration. It’s a case of more needs for less. To summarize so far: two vectors have impacted on design-led urban regeneration strategies to challenge their orthodoxies. One has been a growing realisation of the limitations of the indirect, causal approach of using design to stimulate urban regeneration. The other, probably more influential, has been the decline of the economic basis on which this strategy is founded. The question now is whether to pursue a seemingly outmoded role for design in economically difficult circumstances, or to leverage new approaches from within design practice itself to rethink how urban centres might function. From the 1980s, discourses of design were largely dominated by the private sphere. Design magazines, books and exhibitions have focused mostly on high-end furniture and products for lifestyles or on visual communication for commerce. Equally, academic work in design has revolved around issues such as product usability, technological innovation or design management for competitive advantage. In the past 10 years, however, there has been a significant turn within the broad area of design towards activist, participatory and co-creative processes that emphasize the collective, public sphere (Gamman and Thorpe 2011; Manzini and Staszowski 2013). In part this has come through a revindication of the 1960s and 1970s work of Victor Papanek, who developed participatory approaches to design for social and environmental agency in Nordic countries, not least through his Helsinki workshop of 1968 (Clarke 2013). This inheritance is further bolstered by ambitions that see design at the forefront of combatting climate change. Design and social innovation are now coupled in the search for ways to deliver equitable, socially inclusive and carbon neutral neighbourhoods (Manzini and Jégou 2005; Thackara 2005). Working in parallel with this activist impulse has been a move toward thinking of design in terms of networks, systems and strategies rather than discreet objects. From around 2000, the new specialism called ‘service design’ began to be defined as a response to the growth of the service sector in post-industrial economies (Saco and Gonsalves 2008; Kimbell 2009; Stickdorn and Schneider 2010). It pays attention to the orchestration of multiple artefacts that constitute a service environment (such as a combination of web, smart-card and products) and their positioning and sequencing. It is very much concerned with the relations and exchanges that go on between actors and artefacts within a system. A key component of the service design approach is foregrounding research into the user ‘journey’ or experience. Importantly, service design has found its way into a key role in the rethinking public services (Julier 2010; Design Commission, Policy Connect 2013). In particular, in the context of stringent budget cuts, service design together with social innovation has begun to redefine how public bodies conceive their publics. An important change here is in the move toward thinking in terms of an ‘outcome’ focus as opposed to a service delivery focus (e.g. Miller 2010). Public sector bodies are looking for the most pragmatic ways by which such responsibilities as health, social welfare or cultural services can be most effectively fulfilled. Here a re-framing of citizenship may even take place, wherein people become active in completing these responsibilities (Bason 2010). This recalls Manzini and Jégou’s notion of ‘results’-driven design, where responses to problems are not pre-determined in terms of design outcome; rather, the most effective and appropriate (particularly in environmental and social terms) response is sought (Manzini and Jégou 2005). This calls for a radical re-conceptualization of design’s aims, processes and outcomes. By prioritizing results over means to achieve these, design is immediately taken outside its sub-disciplinary structures of ‘graphics, ‘interior’, ‘product’ and so on. It becomes media-agnostic. Second, the designer is not necessarily looking to solve problems; they might, instead, be looking to already existing activities and then designing ways to make these more sustainable and/or scale them up for greater impact. While design in its more traditional formats continues, one might see the emergence of new thinking and practices as part of a rapid accumulation of sub-disciplines, which makes its general reach ever wider. Design touches on more and more other disciplines, enfolding them into its activities, and designers have embraced methods drawn from, for instance, anthropology, ethnography, psychology and environmental science, to varying levels of rigour and criticality. In disciplinary terms, the traffic has become ‘two-way’ in the case of management studies, with ‘design thinking’ making incursions into a number of business schools, including the Copenhagen Business School. The concept of design thinking has a varied history (Kimbell 2011 and 2012), but most recently it has come to involve the iterative processes of user-observation, visualisation, prototyping and analysis, leading to a more exploratory approach that creatively tries out and tests ideas rather than being bound by predetermined business management routines. Ultimately, this can lead to a more open-ended approach wherein a fixed design solution is not necessarily regarded as an optimal outcome. Instead, actors engage with so-called ‘wicked problems’ (Rittel and Webber 1973; Buchanan 1992) where the design problem itself may be constantly re-determined, as it is in itself under continual evolution. This in turn, can lead to longer-term envisioning of the role of design. Most recently, such developments in design practice and thinking have moved, in some contexts, closer to policy-making. A plethora of design or innovation labs have emerged around the world that attempt to use the techniques outlined above to ‘design’ government policies (Armstrong et al 2014). Denmark is particularly noteworthy for the presence of MindLab, ‘a cross-governmental innovation unit which involves citizens and businesses in developing new solutions for the public sector’ (MindLab 2014). Though brief, the above exposition of changes in the roles, status and practices of design in the past decade provides a useful setting for understanding Kolding’s aspirations to be a ‘design city’. As techniques for ensuring economic growth, environmental stability and social equity, the tried and tested formats of design-led urban regeneration through urban design, creative industries development, cultural planning and place-branding were past their ‘sell-by dates’. Meanwhile, a constellation of interests, from activist impulses to local governance through to business, has provided a context for another kind of design, still in its infancy, but with the potential to reframe design-led regeneration approaches. The small Danish city of Kolding provides a compelling test-bed for their development. The project to put design at the heart of its entrepreneurship, education and social innovation activities moves it from being an end of policy to being the means through which these three civic aims are progressed. This process-orientation requires a particular temporal regime. Rather than being seen as a ‘deliverable’ within frameworks bound by policy cycles, design is an on-going and iterative process. The overall vision of city transformation for Kolding has been mapped out across 10 years. As such, it eschews the ‘fast’ tactics of the more ‘traditional’ design-led urban regeneration programmes discussed above that commonly move from planning to design and implementation within two years. Next, we offer a brief background on the problems facing the city and where some of its potential for reinvention lies, before explaining the process that led to Kolding’s strategy. A tiny city in global terms, on a national scale Kolding is still the seventh largest city in a country of 5.6 million people. A seaport situated on the western end of the bridge that links the island of Fyn with Jutland built in the late 1990s, and with good motorway links to northern Germany, the city has been an important logistical hub. However, the global economic crisis has slowed down trade. Further, the building of a 62,000 sq m shopping centre, with 120 shops on the city’s outskirts in the early 1990s, has contributed to the hollowing out of its centre. The global financial crisis worsened the situation, and by 2012 ‘to let’ signs hung in many shop windows while the night-time economy became markedly quiet. Population growth has stagnated. Although the city is home to one of Denmark’s two design schools and campuses of the University of Southern Denmark, the International Business Academy and University College South Denmark, few of their 4,500 students settle in Kolding and their lecturers mostly commute from Copenhagen, Aarhus or Odense. Analyses showed that Kolding’s image was at best neutral – at worst bland. Many outside of the municipality knew little if anything about Kolding (see also Jungersen & Hansen 2014). Economically though, Kolding has had its moments. As a centre for commerce, production and logistics it was ranked the number one business centre in Denmark in 2009. There is a strong tradition for entrepreneurship in the area, and this tradition translated into an ambition to become a hub for entrepreneurs, tourism, innovation and new energy. The rapid decline of these aspects has been met by the ascendance of design research and education in the city. The Kolding School of Design has consolidated strengths in design management research and design for sustainability and social innovation. In partnership with the University of Southern Denmark, a Centre for Design, Culture and Management has been established. This runs a number of initiatives researching the embedding of design into small and medium enterprises, and also exploring the role of social capital in business innovation. The University of Southern Denmark has rapidly developed its design studies by clustering all design-related research and teaching into its Kolding campus, including tourism and leisure studies, media and communications, economics and management. Notably, it has established research and teaching in the new field of Design Culture, an approach to understanding the role of design in contemporary society informed by the humanities and social sciences. In these and many other ways, the city’s higher education initiatives have become an important focus and motivation for envisioning a new design culture at the centre of civic life. A detailed description of the formation of Kolding’s vision allows us to understand the co-creative processes employed, and appreciate the importance of achieving citizen ‘buy-in’ into a long-term ambition for change. This allows us to appreciate how service design and design thinking approaches were embedded into the concept development for a new kind of urban regeneration, and into the strategies and plans that have followed it. The new vision came through a distillation process that resulted in a clear direction for future policy and strategy development. A private consultancy, Copenhagen-based Stagis, was hired to guide the process. This in itself was conceived as a design process and included an anthropological mapping, creative workshops with local politicians, with local representatives from business, education, public institutions and culture and leisure associations and finally, a huge community meeting for all citizens of the municipality. It began in June 2012 with a workshop with the politicians of Kolding Municipal Council whose objective was to clarify the ambitions and goals for the process as well as the challenges that the vision was to confront. Regarding these, the politicians talked about creating growth, cultivating Kolding’s image and strengthening the focus and community base for the future development. The politicians wanted the vision to become a beacon for the entire community, and the ambitions were for Kolding to become an attractive place to live and do business, a place of growth populated by proud citizens who become ambassadors for the city and the community. The participants worked in mixed groups through six stops on the journey. At each stop they were asked to perform a task, for example to describe an everyday situation, write a postcard or give examples of how the vision would impact a local business. 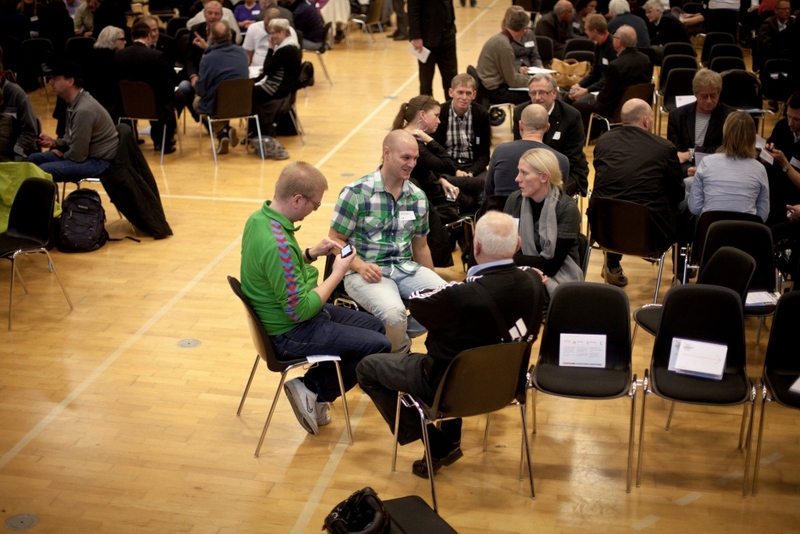 At one stop the participants were asked to come up with an idea for an annual event, at another they were asked what they thought could make people excited about Kolding in 2022. Following the future journey, the groups were asked to prepare a two-minute speech for the mayor of Kolding in 2022, reflecting on how the vision would have made its mark on Kolding. Each group selected a mayor among the participants to present their speech. As a final task, the participants were asked to vote with their feet and select their preferred scenario. Most – a third of all participants – chose the Design City of Volunteering, whilst the Design City of Culture was the least popular. For each scenario a stage had been created, and the scenarios were presented through artefacts, short films, speeches and dialogues with volunteers from many different communities – education, business, culture etc. – involved in the presentations. After each presentation, participants were asked to discuss questions related to the scenario in small groups. Using mobile phones the groups used SMS to comment on the scenarios and questions – and all the comments were projected onto a huge screen for all to see. The streaming of comments made it possible for the 650 participants to simultaneously engage in a common discussion. It became a co-creative process where one comment would feed new comments and ideas, and the screen became a living tapestry recording the event. This Vision Forum continued with a panel debate with local ‘,’ (in Danish ‘ildsjæle’) from the local business community, educational and cultural institutions and the sports clubs and community associations to discuss the prospects of the three scenarios and how they would affect their lives and community. Throughout the debate, people continued to make SMS comments, and the panel participants would even spontaneously respond to some of these. The evening closed with a physical task for the 650 participants. Similarly to the earlier workshop, the participants were asked to vote with their feet, and select the scenario they would prefer to live in. This time the Design Municipality of Enterprise and the Design Municipality of Knowledge proved by far to be the most popular. The Vision Forum was the last input before the final wording of the vision was settled. All in all about 900 people – one per cent of the population of the entire municipality – had participated in creating a new vision for Kolding. In the end, the politicians voted on a vision that embraced aspects of all the future scenarios of Vision Forum: entrepreneurship, social innovation and education. Conceiving the vision process as a design process proved to be a strength, as it helped build commitment. Design thinking is iterative by nature, and through a process of defining and redefining a problem, it allows for intermediate concepts to become potential starting points of alternative paths, or even to change the initial problem as a given (cf. Cross 1982). With each of the iterations, more and more citizens became involved in the process. Arguably, 900 people is only a fraction of the municipality’s 90.100 inhabitants; however, they represented a broad section of the population in terms of age, gender, ethnicity as well as education, profession and community affiliations. For those who participated, the involvement in the process was meaningful, and the feedback was overwhelmingly positive. One of the early outcomes of this commitment was creating the Design Kolding Network and enrolling about 50 civic actors from local business, education, culture and community associations to act as ambassadors for the vision and to contribute to developing and implementing initiatives. As stated above, using a traditional design-led approach to urban regeneration often directs attention towards specific material outcomes – tangible things like a university campus, visible like a wayfinding system, or schematic like a social media settlement campaign. You will find all of these in Kolding. However, the role of design is conceived above all as a processual activity. Within the municipal organisation two major processes were immediately initiated. One involved the political committees, with the purpose of evaluating and revising existing strategies and policies in accordance with the vision. At the Department of City and Development, this meant politicians getting first-hand experience with design thinking tools. The second process involved all levels of management in creating a new leadership foundation in the spirit of the vision (Jungersen & Hansen 2014). Both processes utilized design thinking and design methods, the ambition being to rethink the inner workings of the municipal organisation. As an example of initiatives under Design & Branding, ‘Design on Tour 13’ built directly on the vision process. This involved municipal staff and more than 50 civic actors, who toured the municipality over the summer of 2013 in a converted MPK Smutti caravan (notably designed in Kolding the 1970s) under the headline ‘This Is How We Design For Life’. The purpose of the tour was to make design more tangible and to initiate a dialogue about design with citizens and visitors. Another example, from the theme of Education, was the development of methods for assessing children’s and young people’s skills in design, creativity, problem-solving and entrepreneurship. Within the Danish school system, art education, including design, is largely considered to be recreational and is by and large separated from the main curriculum, hence meaningful aptitude evaluation hardly exists (cf. Bamford and Qvortrup 2006). In Kolding’s pre- and primary school system, design and innovation are integrated in the curriculum under the headline ‘Design From Diapers To Doctorate’, making design an aptitude in line with skills like reading and writing. Interestingly, embedding a new design culture into urban regeneration is coming to be more about the strategic theme of Social Innovation and even Entrepreneurship than about Design & Branding. Whereas city planning usually focuses on floors, walls, buildings and infrastructure, the new focus turned to those who use the city’s spaces, with challenges of the city centre addressed in a new City Life Strategy for the town. The catchphrase for the strategy paraphrases the wider vision: Together, We Create A Better City Life. The City Life Strategy has been created together with students, local businesses, architects and other citizens, but more importantly, it is being partly implemented through civic processes, where the role of the municipality becomes that of facilitator of design thinking processes, and the participants are active in realising their input and ideas. In Eltang, a small community to the north east of the city centre, a new residential area has been proposed. Creating a master plan for the area is traditionally a task that falls to architects and city planners. However, in Eltang, local people along with potential settlers in the area were invited to co-create the plan. A so-called pioneer group was formed, and the members have participated in several design workshops. Even school children participated and contributed. The purpose of the process is to create community ownership of the project, and give citizens an opportunity to take part in designing their local environment. The focus of both examples of urban regeneration is on people and social innovation. While this development rests on global advances around service design and design thinking, it also has a more local pedigree. The examples reflect a distinct tradition in Danish urban planning, which to a great extent was fathered by the architect and urban designer Jan Gehl in his influential book Life Between Buildings, first published in Danish 1971 (in English 1987). Working with urban generation on a human scale, rather that on the scale on buildings and infrastructure, is a trademark of Gehl Architects, and has influenced city planning in Denmark for four decades, and in recent years also New York, Australia and New Zealand. Gehl’s holistic approach, which draws from anthropology and sociology as well as psychology (cf. Gehl and Svarre 2103), is therefore verycompatible with design thinking methods, putting urban design at the centre of civic processes. While the Kolding case has emerged through a localised set of circumstances and activities, it may also be understood against national changes in approaches to governance and regeneration. Design in Denmark is undergoing important changes that reflect some of its broader global movements. While especially since the 1980s, design has been promoted by national and regional bodies to ensure industrial and commercial competitiveness, new departures are consolidating it in new ways in the public domain. This is partly driven by a recognition of design’s ability to innovate cost-saving measures (e.g. Policy Connect 2012), but it is also about shifting forms of governance. Notable here is a move toward ‘network governance’ where, ‘the role of the state is to steer action within complex social systems rather than control solely through hierarchy or market mechanisms’ (Hartley 2005, 30). Within this, the sub-disciplines of service design, social design, strategic design and design for social innovation become entangled in ideas of co-creation and participation. To some extent, this is discernible within the envisioning process of the programme for Kolding to become a design city itself that this article explains. However, the Danish context opens onto these changes in design generally and the Kolding example more specifically in other ways also. The Danish tradition of ‘negotiated economy’ underlines an enthusiasm for the interlocking of civic institutions and enterprise within broadly set out programming (Kjær and Pedersen 2001; Pedersen 1993). Here economic coordination is achieved through organised negotiations among autonomous actors in both public and private sectors. Governance has been developed through the decentralisation of decision-making and the spread of autonomy and authority across private and public institutions. By foregrounding the active and structural components of education, entrepreneurship and social innovation, rethinking Kolding as a design city brings civic actors together in a broad-based constituency across an extended timeframe. Another driver specific to Denmark has been in its engagement with the concept of the ‘experience economy’. First coined by American business consultants Pine and Gilmore (1999), it has been promoted through a government ‘trigger report’ (Danish Government 2003). This has supported enthusiasm for the use of cultural planning in regeneration across many of the country’s regions and cities (Freire-Gibb 2011). Critique of its ‘one size fits all’ deployment toward the end of the 2000s has coincided with budgetary constraint as the result of the economic crisis. Subsequently, Kolding’s regeneration programme has been established in the context of something of a national policy vacuum. It is a case of re-designing its way out of its own crisis. More specific to Danish design culture, there has also been a turn in its representation. Danish design has been very much dominated by a post-war legacy of globally influential designers such as Arne Jacobsen, Georg Jensen, Hans Wegner and Poul Henningsen. Their sleek, Scandinavian modernism has marked the national and international design consciousness ever since. In recent years, however, there have been attempts to move this image forward such as through the ‘Index: Design to Improve Life’ awards, funded by the Danish government. A series of mapping and policy documents on the Danish design sector (Copenhagen Business School 2005; The Danish Government 2007; Design2020 Committee 2011) strikes out in this direction. In these ways, Kolding as a design city must be seen as the outcome – or, rather, the instigation of a process – that comes from shifting local, national and global conceptions of design, governance and political economy in the service of regeneration. This article has contextualised a local initiative against a background of debates on the changing role of design and regeneration. It is too early to make judgements on the efficacy and suitability of Kolding’s strategy of placing design at the centre of all civic processes. Its decisions on this have come from were force of circumstances have met new opportunities brought about through historical developments in design itself. While we have reported on an innovative approach in the participatory development of this vision, a number of questions remain. The level of participation in this envisioning process was relatively high and certainly grounded in a broad representation of the population. However, how is buy-in ensured among those who did not participate? Or, does this matter? There is a current global interest in embedding design into policy through design labs that are closely connected to the tissues of governance. But is this itself merely a fashion, which will disappear as fast as it has emerged, and how might it undermine the rhetoric of Kolding as a design city? To make a larger observation, design thinking as a response to structural problems might be regarded as merely plugging a gap created by a loss of any coherent governmental strategy in the social and economic sphere. It temporarily fills a policy vacuum produced at national and international levels. This may be due to the undermining of previously-held certainties regarding regeneration approaches within the neoliberal frame, but it could equally signal a drift toward neoliberalism’s post-political tendency (Wilson and Swyngedouw 2014). Design practice, conceived of as a problem-processing and problem-solving exercise, is adept at spotting openings and opportunities. These may come thick and fast when there is a deficit of strategies to deal with pressing economic and social challenges. Should we regard it as anything more than opportunist? In Kolding, there is a clear commitment to this as a long-term strategy, but questions remain: How do you demonstrate shorter-term impacts and maintain enthusiasm? How can the complexities of design as processual be communicated to the public? And should its materialisation be emphasized more? To bring the discussion full circle, what is the role of aesthetics here? Critics of the Kolding experiment may argue that at least with earlier forms of regeneration there were visual and material markers that provided some level of civic feedback. In design thinking meanwhile, with its appeal to ’non-designers’ and its emphasis on iterative, failure-friendly testing and strategic management, style seems to get emptied out. How do you reintroduce design into design thinking in this civic context? This deficit requires that more sophisticated and critical attention be paid to regimes of taste and fields of know-how (Tonkinwise 2011). If the big civic stuff that signifies regeneration, like iconic, cultural buildings or urban design schemes, is absent, we have to look to fashioning change at more intimate levels. We’d need to get in amongst aesthetic judgements and make these observable, communicable and understandable. The challenges of doing this within a long-term process are considerable, as is apportioning the task between designers, city managers and citizen groups. The feeling of precariousness that hovers over these questions and many more, echoes those of the wider realities of scarcity, climate change, social inequity and economic infirmity. ‘Kolding – We Design For Life’ suggests an extended experiment that is set out on localized grounds. Perhaps experimentation is all we have left. Anholt, S. (2002). Foreword. Journal of Brand Management 9: 4– 5:, 229–40. Armstrong, L., Bailey, J., Julier, G and Kimbell, L. (2014). Social Design Futures: HEIs and the AHRC (report), London. Bason, C. (2010). Leading Public Sector Innovation: Co-creating For A Better Society. Policy Press, Bristol. Bell, D. and Jayne, M. (2003). “Design-led” Urban Regeneration: A Critical Perspective, Local Economy 18:2, 121–34. Bennett, R. and Savani, S. (2003). The Rebranding of City Places: an International Comparative Investigation. International Public Management Review 4:2, 70–87. Berglund, E. (2013). Design as Activism in Helsinki: Notes from the World Design Capital 2012, Design and Culture 5:2, 195–214. Boddy, M. and Parkinson, M. (2004). City Matters: Competitiveness, Cohesion and Urban Governance. Policy Press, Bristol. Clarke, A. (2013). “Actions Speak Louder”: Victor Papanek and the Legacy of Design Activism. Design and Culture 5:2, 151–168. Copenhagen Business School (2005). The Danish Design Industry Annual Mapping (report), Imagine, Copenhagen. Cross, N. (1982). Designerly Ways of Knowing, Design Issues 3:4, 221–227. Design2020 Committee (2011). The Vision of the Design2020 Committee (report), Copenhagen: Danish Enterprise and Construction Authority. Design Commission, Policy Connect (2013). Restarting Britain 2: Design and Public Services (report). Evans, G. (2003). Hard-branding the cultural city – from Prado to Prada, International Journal of Urban and Regional Research 27:2, 417– 441. Freire-Gibb, L. C. (2010). The Rise and Fall of the Concept of the Experience Economy in the Local Economic Development of Denmark, European Planning Studies 19:10, 1840–1853. Gamman, L. and Thorpe, A. (2011). Design with society: why socially responsive design is good enough, CoDesign International Journal of CoCreation in Design and the Arts, 7:3–4, 217–231. Gehl, J. (1987). Life Between Buildings: Using Public Space. Van Nostrand Reinhold, New York. Gehl, J. and Svarre, B. (2013). How to Study Public Life. Island Press, Washington D.C.
Gonzaga, S. (2012). From a Design Museum towards a Euroepan Cultural Place: the Design Milieu: Strategies for European Design Culture in the Globalization Era, PhD presented at the Politecnico di Milano. Hassan, G., Mean, M. and Tims, C. (2007). The Dreaming City: Glasgow 2020 and the Power of Mass Imagination. Demos, London. Julier, G. (2009). Designing the City, in Guy Julier and Liz Moor, L. (eds), Design and Creativity: Policy, Management and Practice. Berg, Oxford. pp. 40–56. Julier, G. (2010). Design and Political Economy in the UK. Knowledge, Technology and Policy 22, 217–225. Jungersen, U. and Hansen P.K. (2014). Designing a Municipality. Paper presented at NordDesign 2104 August 27–29. Available at: www.kolding.dk (accessed August 24, 2104). Kauko, T. (2010). Sustainable Urban Property Development and Neighbourhood Dynamics. The Open Urban Studies Journal 3, 103–111. Kimbell, L. (2009). The Turn to Service Design, in: G. Julier and L. Moor (eds) Design and Creativity: Policy, Management and Practice. Berg, Oxford. pp. 157–73. Kimbell, L. (2011). Rethinking Design Thinking: Part 1, Design and Culture 3:3, 285– 306. Kimbell, L. (2012). Rethinking Design Thinking: Part 2, Design and Culture 4:2, 129–148. Kjær, P. and Pedersen, O. K. (2001). Translating Liberalization: Neoliberalism in the Danish Negotiated Economy, in John L. Campbell and Ove K. Pedersen (eds. ), The Rise of Neoliberalism and Institutional Analysis. Princeton University Press, Princeton. pp. 219–248. Manzini, E. and Jégou, F. (2005). Sustainable Everyday: Scenarios of Urban Life. Edizione Ambiente, Milan. Manzini, E. and Staszowski, E. (2013). Public And Collaborative: Exploring The Intersection Of Design, Social Innovation And Public Policy. DESIS Network, New York. McCarthy, J. (2007). Partnership, Collaborative Planning and Urban Regeneration. Ashgate, Aldershot. Miller, E. (2010). Can the shift from needs-led to outcomes-focused assessment in health and social care deliver on policy priorities?. Research, Policy and Planning 28:2, 115–127. MindLab (2014) website: www.mind-lab.dk/en (last accessed 6 January 2014). Papadopoulos, N. and Heslop, L. (2002). Country equity and country branding: Problems and prospects, Journal of Brand Management 9: 4/5, 294–315. Pedersen, O. K. (1993). The Institutional History of the Danish Polity: From a Market and Mixed Economy to a Negotiated Economy, in Sven-Erik Sjöstrand (ed. ), Institutional Change: Theory and Empirical Findings. M.E. Sharpe, New York. pp. 277–300. Pine, J. and Gilmore, J. (1999). The Experience Economy. Harvard Business School Press, Boston. Policy Connect (2013). Re-Starting Britain 2: Design and Public Services (report). Available at: <http://www.policyconnect.org.uk> (accessed 5 September 2014). Reimer, S., Pinch, S. and Sunley, P. (2008). Design spaces: agglomeration and creativity in British design agencies, Geografiska Annaler: Series B, Human Geography 90:2, 151–172. Rittel, H. and Webber, M. (1973). Dilemmas in a General Theory of Planning, Policy Sciences 4:2, 155–169. Saco, R. and Gonsalves, A. (2008). Service Design: An Appraisal, Design Management Review 19:1, 10–19. Stagis, N. (2012). Den autentiske virksomhed. Gyldendal, Copenhagen. Stickdorn, M. and Schneider, J. eds (2010). This is Service Design Thinking. BIS Publishers, Amsterdam. Wilson, J. and Swyngedouw, E. (2014). The Post-Political and its Discontents: Spaces of Depoliticization, Spectres of Radical Politics. OUP, Oxford. Syrett, S. and North, D. (2008). Renewing Neighbourhoods: Work, Enterprise and Governance. Policy Press, Bristol. Thackara, J. (2005). In the Bubble: Designing in a Complex World. MIT Press, Cambridge, MA. The Danish Government (2003). Denmark in the Culture and Experience Economy – 5 new steps (report). Available at: (last accessed 6 January 2014). The Danish Government (2007). DesignDenmark (report). Schultz, Copenhagen. Tonkinwise, C. (2011) A Taste for Practices: Unrepressing style in design thinking, Design Studies 32:6, 533–545. Turok, I. (2009). The distinctive city: pitfalls in the pursuit of differential advantage. Environment and Planning A 41:1, 13–30. Urban Task Force (2005). Towards a Strong Urban Renaissance (report). Available at: <http://www.urbantaskforce.org/UTF_final_report.pdf> (last accessed 6 January 2014).